How many times in a day do you look at your phone or watch or desktop clock – just waiting – waiting for a call, or lunchtime, or the end of the work day. Most of the time we think of waiting as a bad thing – securing a new license at the DMV or anxiously anticipating riding Space Mountain. Waiting doesn’t always have to be bad and unnecessary. Sometimes things are worth a wait – letting your food simmer a minute longer may make all of the difference, or allowing an extra month for your perfect next home to become available. How does this relate to Marketo? Wait steps! Wait steps can be powerful, but there are certain things to keep in mind to avoid wait step dangers. Before sending emails (one of the most common uses) – want to separate webinar invites so that one goes out this week and one next week, all in one smart campaign? Throw in a wait step! Changing data values, statuses, alerts, and adding to lists – waiting to see if the email gets delivered before changing the program status to “invited”? Include a short wait step. Sync related – Marketo is syncing constantly, but in short intervals. Sometimes we want to make sure a lead has time to get assigned or get other SFDC values associated before then taking the next flow step, example sending an email from their newly assigned lead owner. 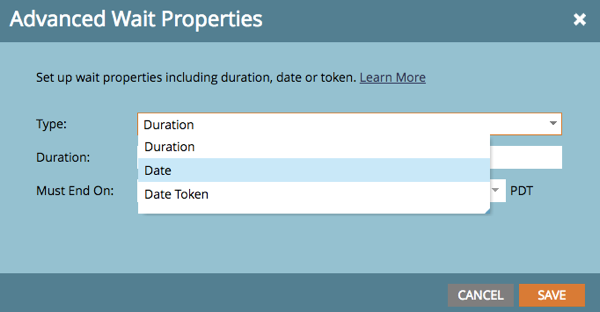 Wait steps even allow not only setting time durations but specifying days, dates, etc. making them a very flexible tool! Too many wait steps – it is too easily to go over the top with wait steps. The danger then is not knowing what campaigns are waiting the different intervals and how that is affecting other related campaigns. Tip: use the Campaign Inspector to check out how many wait steps your instance is using – type “Wait” into the search bar at the bottom. You may consider “fast-passing” some of these and removing the wait steps. Changing wait steps – If you want to change the timing of a wait step or add additional flow steps, the wait steps act with a certain behavior (stamping the original wait time and looking for the next numbered step). Keep this in mind as at this point it’s usually easier to build a new campaign. Can’t finish what you started? Remove the flow steps following the wait step. Just delete the following flow steps and when the lead is done with the wait, nothing will happen. This has to be done before in advance. Your waiting is over, get back to it! 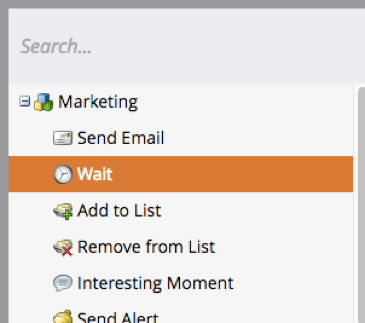 All in all, wait steps are very powerful tools in Marketo but they can also be tricky. Keep the above points in mind when using them – use them sparingly when it makes sense and be prepared to remove leads from flows if necessary. And now the wait is over – get back to it!